When you travel, or even when you try a new restaurant for the first time, you never know what you’re going to get. The differences in cuisines around the world is one of the reasons I love to travel so much, but lets face it, sometimes the food is just not to your liking. I won’t say that the food is not good because that is relative to your tastes. You may like, or need, bland food for dietary reasons. I, on the other hand, like my meals well-seasoned – read: with tons of spices and flavors – so I sometimes find dishes bland and tasteless. My solution not only made my stomach happy but also helped me find love in the process. Intrigued? Read on. What’s a traveling foodie to do with bland food? Travel with condiments! Airport security checkers are often perplexed when they see my clear toiletry bag. Nestled right next to my 3oz bottles of shampoo, lotion and body wash, they see my bottle of Lawry’s Garlic Salt. Let me be clear, this post is in no way sponsored by McCormick or Lawry’s, although I wouldn’t mind if they gave me a call, considering I go through this stuff like it’s confetti in a parade. There are many gourmet garlic salts out there so what earns this one a coveted spot in my carefully packed carry-on bag? It’s simple. My mom used it in everything. It’s a flavor that I’ve known since I’ve been eating solid food. Some things just become staples in your diet because of tradition, don’t they? Here’s where this story turns romantic. Your favorite condiment doesn’t just help rescue your dinner when you’re faced with a nondescript plate of bland chicken and vegetables at a little restaurant in a remote destination, it can even help you fall in love. I am certain my boyfriend (now husband!) fell in love with me during our first weekend away at a small beach house in Manzanita, along the beautiful Oregon coast. What did I do to seduce him? Wait for it… I whipped out my bottle of garlic salt to season the steak and onions I was sautéing for dinner. Well, guess what? It’s the same one his mom used while he was growing up! Thanks Lawry’s. It was truly love at first bite. Our shared love of food has kept us going for over twenty years now! To my single ladies out there, don’t despair. They say a way to a man’s heart is through his stomach, so just carry around your favorite condiment and you may just find your match. I did! Upon boarding on our first cruise, the Mecca of unlimited eating extravaganzas, we were handed our pretty umbrella drinks and immediately made a bee-line for the buffet. The food was bountiful and varied, well prepared and… bland! Ughhh! When you’re cooking for thousands, the chefs tend to play it safe with the seasonings. My BF and I immediately looked at each other and in unison proclaimed, “I wish we had some Lawry’s garlic salt!” No joke! I think we frightened the kids at the table next door. At that very moment, scribbled on a cocktail napkin, we began compiling a cruise packing checklist with all the essentials needed for a great cruise vacation. It’s the list I’ve used since then on more than 12 cruises, and have shared with many friends who all swear by it. When you’re on the high seas it’s a little tough to get to your corner convenience store. The same now applies to my international travels. By now you know what item has a spot on that packing list. Ding ding ding! Yes, my little bottle of garlic salt, and a few other condiments. If I ever become a contestant on Survivor, my one luxury item to bring on the island would be that little bottle of meal-rescue magic. I could eat anything as long as it has a sprinkle of seasoning. At The Food & Wine Conference in Orlando, an amazing gathering of food bloggers and brands, our swag bag contained a special gift by The Saucy Queen herself, Michelle Northrup. A little travel size bottle of her Intensity Academy Chai Sweet Chili hot sauce. It is quite tasty with fresh flavors of brewed chai tea and Thai chili peppers and certain to make anything you encounter in your travels, taste much better. I have now added that bottle to my toiletry bag. Everything in life should be approached with as much fun and exuberance…and of course “a bottle of hot sauce”! 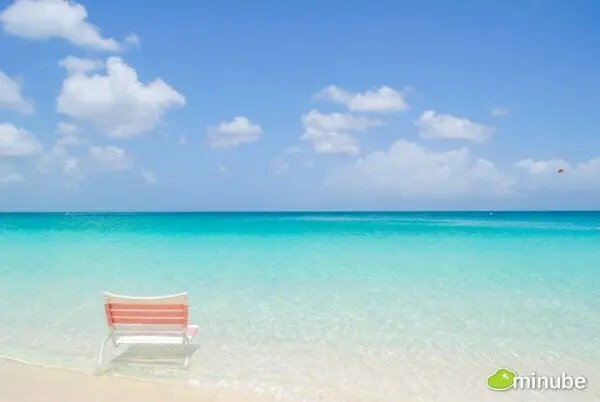 As I prepare to leave on my next trip for a two month consulting project in the beautiful island of Providenciales, Turks and Caicos, I’m not certain what new and interesting things I will discover. I have no idea what the food will be like. It’s quite exciting to try new things and new flavors, but my favorite condiments are already packed, just in case. Do you travel with condiments? I would love to know I’m not alone in this condiment obsession, so please share in the comments below. If you never thought about traveling with condiments, are you willing to try it? I hope you will, there’s no reason to eat bland food! Please join me on my trip to Turks and Caicos and follow the hashtag #GOepicTCI on Facebook, Twitter, & Instagram. I may even go live and share my food finds and whether the condiments were needed. Stay tuned. Plus, I’m warning you in advance. Don’t think someone hijacked my feed if you see more pictures of beaches than food because just look at this gorgeous beach! If you want to travel with condiments and have your condiments inspire your travels, I found this awesome World Traveler Spice Collection on Amazon. Check it out! I also found this travel spice rack with small containers that stack onto each other. 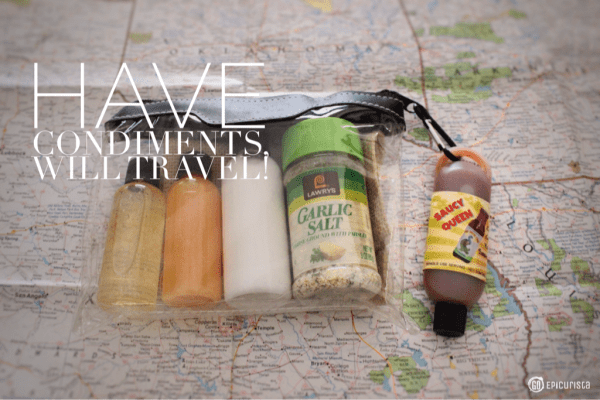 You can fill with your own favorite spices that is small enough to fit in your carry-on! I hope everything in your life comes with fun… and a bottle of hot sauce! Disclosure: This post may contain affiliate links to products I love via Amazon Services LLC Associates Program. At no cost to you, when you make a purchase through this link, I earn a small commission which helps with website costs. Thank you for your support! Kindred spirits! I’m glad to know I’m not the only one who plans ahead for possible dull food. Thanks for checking out Go Epicurista Lindy. I look forward to following along your adventures at LindySez. Cheers! Those little bottles are great! Say NO to bland food! 😉 Thanks fue checking Out GO Epicurista! i have never traveled with condiments before… I do, however, travel with Stevia for my coffee since most places never have it. I might have to add some condiments in my purse too now ? Yes! You never know when bland food will strike! LOL! Thanks for checking out the blog! Cheers! I love the idea of traveling with your favorite condiments. I will start with Saucy Queens travel sized hot sauce because it’s out of this world in deliciousness. Splash a little when your entree needs that entra oomph. That little bottle from Saucy Queen is a perfect place to start! I love that it has a metal hook which attached perfectly to my travel bag. Thanks for stopping by Go Epicurista! Cheers!